Rock Bottom Caverns is a small cave between Chorrol and Skingrad containing goblins. It contains only one zone, Rock Bottom Caverns. This cave contains 8 Cairn Bolete plants and 13 Wisp Stalk plants. 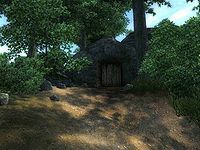 This cave is related to an unfinished quest involving Jirolin Doran of Chorrol, who was originally intended to be brought to the cave by ogres. This location's map marker (M on map) is named Rock Bottom Caverns (editor name RockBottomCavernsMapMarker). The entrance door is NNE of the marker, 40 feet away. This fairly confusing cave is filled to the brink with leveled goblins, rats and a wide array of traps; it is worth exploring, although the quickest way to clear the cave involves a bit of strategy. Upon entering, the tunnel immediately splits into two; both options basically leads to the boss-level chest in the large eastern room, but if you want everything, pick the passage to the right. You will arrive in a room with a gap and a knocked-over tree posing as a bridge. Look down the gap and release the Falling Logs onto the goblin patrolling the lower level, then cross the bridge and dispose of the goblins on the other side (or simply avoid them if you wish). Jump into the gap and land near the bedroll at b, making sure to loot the chest nearby. Proceed through the tunnel until you emerge in the central, rectangular room, which contains several cages with dead rats, patrolling goblins and a roasted rat cooking over a bonfire. Continue east through the tunnel to reach the room with the boss chest at B, the goblin at A, and several more goblins on patrol. After disposing of them, loot the boss chest and return the way you came, heading northwest past the cooked rat. The Tripwire at C will not harm you as long as you keep moving, as the Swinging Mace is designed to guard against approach from the other direction. 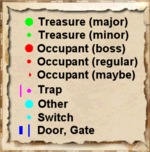 Loot the chest in the last room, ignore another harmless trap, and exit Rock Bottom Caverns through the door labeled Out. This page was last modified on 25 March 2018, at 03:10.